Part of me wonders what this would be like with a lime cap sleeve. Sleeves thwart me. They're always too tight; I feel like I can't move my arms. But I'm stubborn, so perhaps I will eventually figure out what alterations are needed and I will conquer sleeves. You could, OR you could try a black sash or belt and see how the contrast looks. I've seen the lime green bats in Jo-Ann's and didn't like it nearly as much as the darker green bats. But this looks good on you! Thank you! I also didn't like this one as much as the darker green. 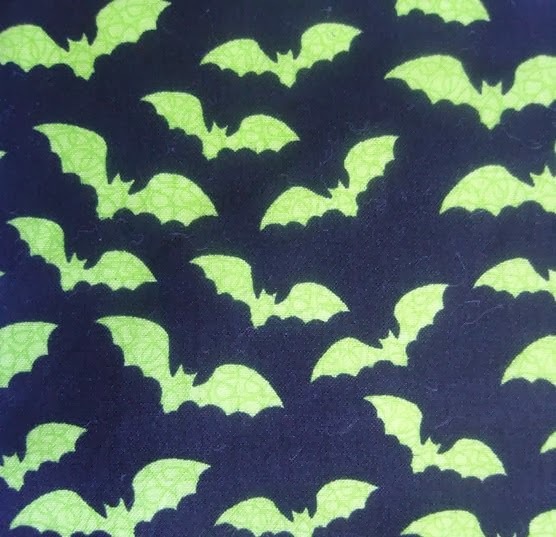 But it has the advantage of a softer texture -- the darker green bats fabric is annoyingly stiff for some reason. Ah, raising the neckline, what a good idea! I prefer a higher neckline too. You could always add some material or a ruffle or something to the others if you ever want to wear them on their own! another fantastic dress! They really look like something you would buy in a (good quality) shop! You have made the cut so well it looks fine without a sash or belt, but you could definitely make one. With my odd skeleton, it was challenging raising the neckline... but worth the effort. It's nice to finally have something I don't have to wear a shirt under. I'll definitely do a black cardigan (of course, I wear a black cardigan with everything). I have a couple of black belts that I can try as well. Thank you! Fantastic job! Fits you like a dream. I like it without a sash, but would look good with one too, hard to decide! I think, a matching sash is a good idea but I think, both lime and black would look great. I think a black sash would be better, since now the lime has the majority. Really cute!! I made a nice full skirt out of that same material. I couldn't pass it up. Oooh, a biker jacket... that's a good idea! I have a short leather jacket that I bought last spring (for 80% off! ), and I've been wondering what to wear it with. I love the bright green! I love the dresses you make and post online. Here is my question: I remember going to the store and looking through pattern books which would give a number to find in several very large bins of patterns. The pattern would be purchased, pinned to the fabric and then the fabric cut and sewn. So how does this pattern thing work today? I used to sew a lot a couple of decades ago; but then I didn't have a sewing machine for a long time and now I have one again. How does one go about this now? 1. Pattern companies put their patterns online, so you have the option of looking through them and/or purchasing from the comfort of your home. 2. Fabric stores such as Jo-Ann and Hancock run pattern sales constantly. Instead of paying the retail price of $10+, you can get patterns for $1 or $2 each.